Day Bang has been called "revolutionary" and "groundbreaking" for its novel approach on meeting women during the day. It's intended for guys who don't want to meet girls solely in bars and clubs. 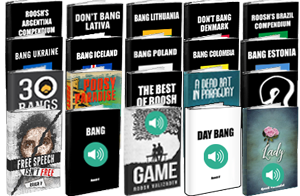 Get my newest masterpiece Game, all of my travel guides, my five memoirs, my two best-selling game books (Bang & Day Bang), my best-of compilation, and three game audiobooks in MP3 format. That's 30 hours of recorded narration and 2,439 pages of life-changing content. Save over 80% off the regular price! Get my two best-selling game guides, which have changed the lives of thousands of men. These books have you covered from meeting women all the way to maintaining relationships with them.